Your skin care routine - not that hard of a concept to master, right? Wash your face, slap on some moisturizer, maybe a treatment every now and then? In theory, skin care is supposed to be idiot-proof, provided you have a super-simple routine. For those of us who have expanded our regimens beyond the usual soap-water-moisturizer approach, there's actually a bit more to it. As we've gotten more involved with our skin, the question of which order to put on our products is a vexing one. "I think it's the most confusing issue in all of skin care, not only to consumers, but to professionals, too," says Dr. Neal Schultz, an NYC dermatologist and founder of DermTV. According to Dr. Schultz, if you don't put your products on in the proper order, not only will the products not work effectively, it's a waste of time, money, and effort. "Nothing bad will happen to your skin [if applied incorrectly]," he explains. "But, if you are going to the store, spending your money, and spending your time, you may as well do it right." Determining that proper order is where things start to get tricky. Since marketers have gotten more and more clever with their product names (a gel-cream here, a serum-oil there, whatever the heck a liquid lotion is), the actual type of product isn't want matters. According to Dr. Schultz, it's the weight of the products you need to be concerned with. When it comes to skincare, how natural is TOO natural? What does that mean? "It comes down to the very fundamental principles of physics and chemistry," says Dr. Schultz. "After you apply your first product, the second product has to have the ability to go through it in order to penetrate the skin." In other words, the first things you put on your skin should be the lightest texture, then work your way up to the heaviest, hard-to-penetrate textures last. So, anything that is water- or alcohol-based should come first, followed by your gels, then your light lotions, then heavier creams, thick serums, and, finally, anything ointment-based (i.e. water-free). One way to tell how heavy the product is? Dr. Schultz says to read the ingredient list. Find out where the oils, lanolins, and petrolatums fall - the higher up they are, he says, the harder the product is to penetrate and the later in your routine it should go. Dr. Schultz says that getting the right order will take some trial and error, as often it can be difficult to determine weight if two products are very similar in texture. One way to know for sure: If the product is just pooling on the skin and not absorbing, then it's not penetrating the skin, and, therefore, not doing your complexion any good. If the product is setting and you don't have any residue, then it has penetrated. According to Schultz, no skin care product (other than an ointment) should just lay on top of your skin - everything should penetrate. Now, according to Dr. Schultz, there are two exceptions to this weight rule: sunscreen and acne products. While it may seem intuitive to do sunscreen last, Dr. Schultz says SPF needs time to set - about 20 to 30 minutes - so he almost always recommends patients apply a lightweight SPF lotion first. Another reason SPF needs to go on bare skin? "Sunscreen molecules must align and orientate parallel to each other, creating a grid that absorbs UV energy," he says. Creams can interfere with this grid, both on physical and chemical sunscreens, because the product can create bumps and ridges on the surface of the skin. In addition, most sunscreens were tested on bare skin, meaning you don't know how applying a cream first will impact the efficacy and duration of your sun protection. So, either apply a light sunscreen first, followed by products that are heavier than that, or skip that whole mess by opting for a moisturizer with sunscreen, or Dr. Schultz' personal favorite, a BB cream. As far as your acne products go, Dr. Schultz says that those product are only really effective if they are applied directly on the problem area of the skin, meaning you don't want other products to interfere with that. 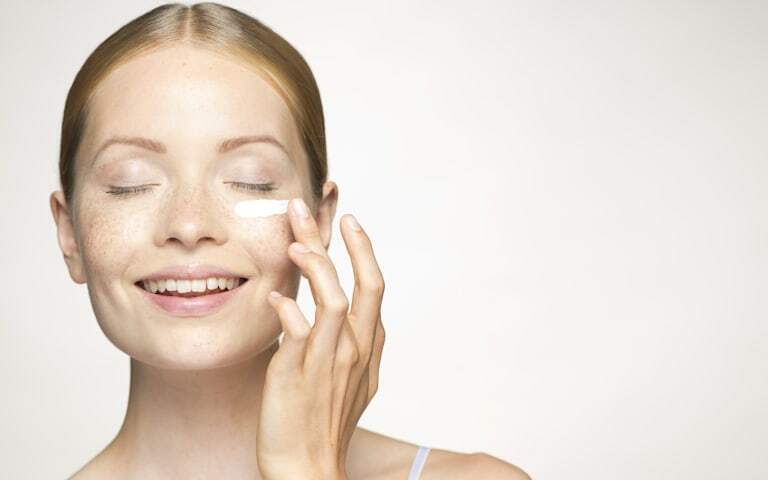 So apply them lightly first (even before your sunscreen), then add the rest of your regimen. See, we told you this skin care thing was more complicated than it looks. The good news is, now that you know how to get the most out of your lotions and potions, you might just find your existing products work that much better for you.